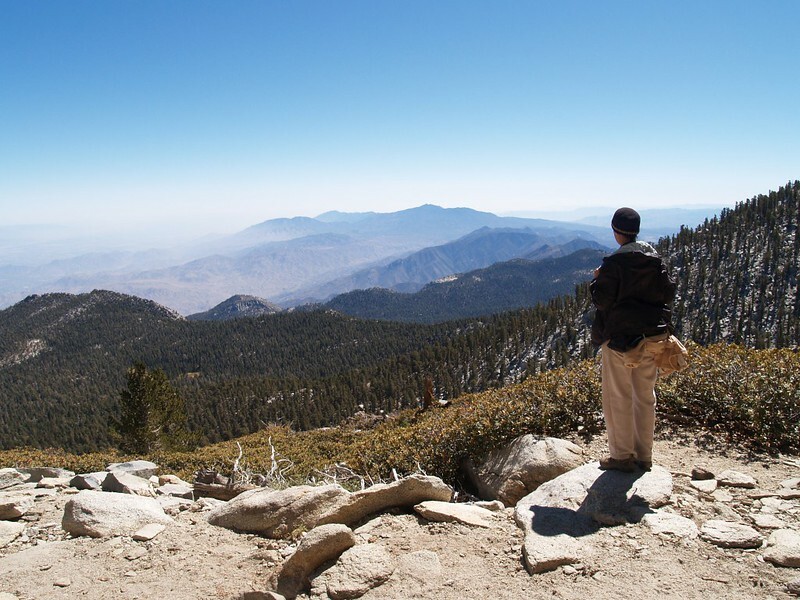 After ascending on the Palm Springs Tram with our backpacks, we spent a windy weekend at the Tamarack Campground in Mt. 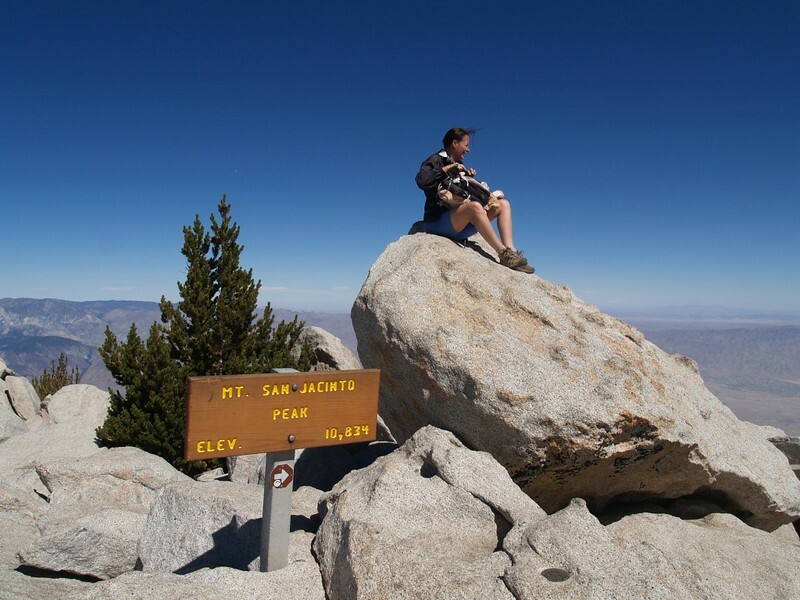 San Jacinto State Park, and climbed to the San Jacinto Peak Summit via the unmaintained “Tamarack Trail” and Miller Peak Ridge Trails. 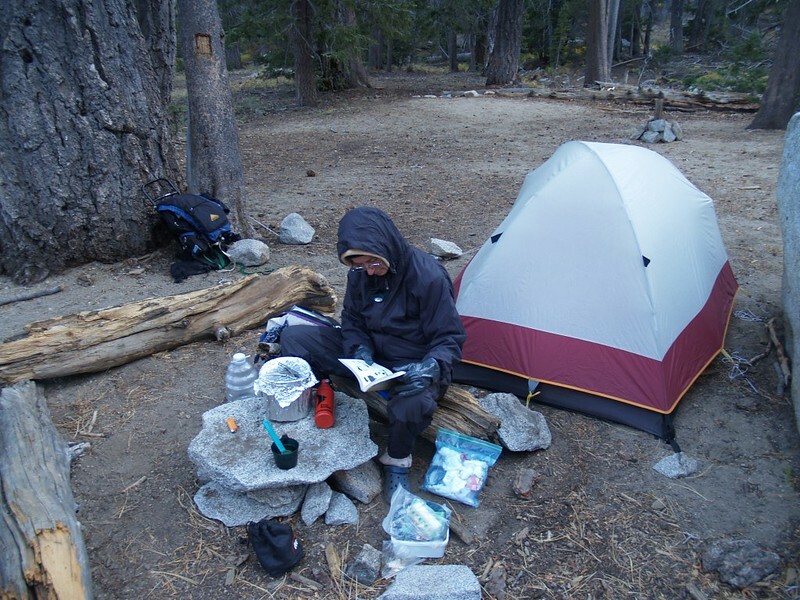 After a fun Summer backpacking trip in the Sierra Nevada, Vicki and I decided to take one last overnighter before Winter arrived and the weather became too cold to visit the mountains. Some people love ice and snow, but we aren’t those people. We like our days comfortably warm (not hot!) and the nights cool. That’s why we go to the desert in the Winter. 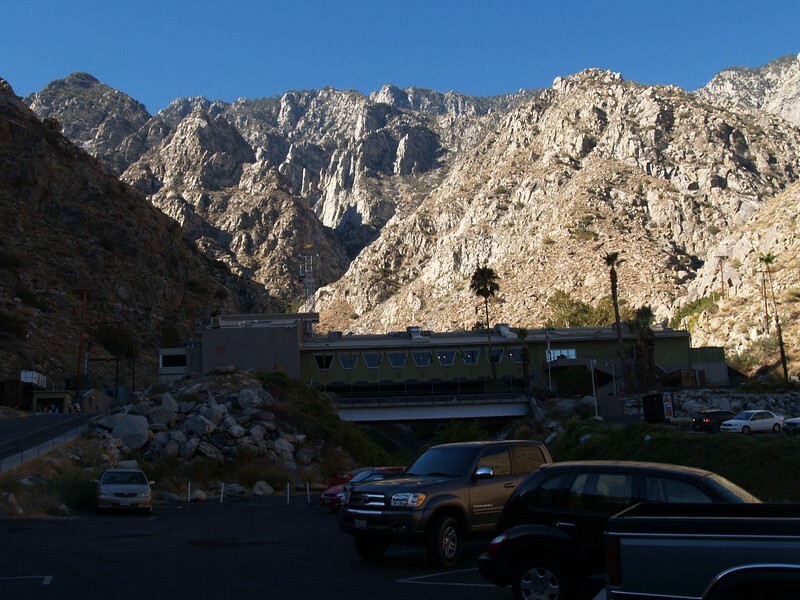 But October is in the shoulder season, so we waited until the last minute for the right weather and headed up to the Palm Springs Aerial Tramway. The tram is the fastest and easiest way to get up into the forest. But it isn’t the cheapest. Still, it’s well worth the money. 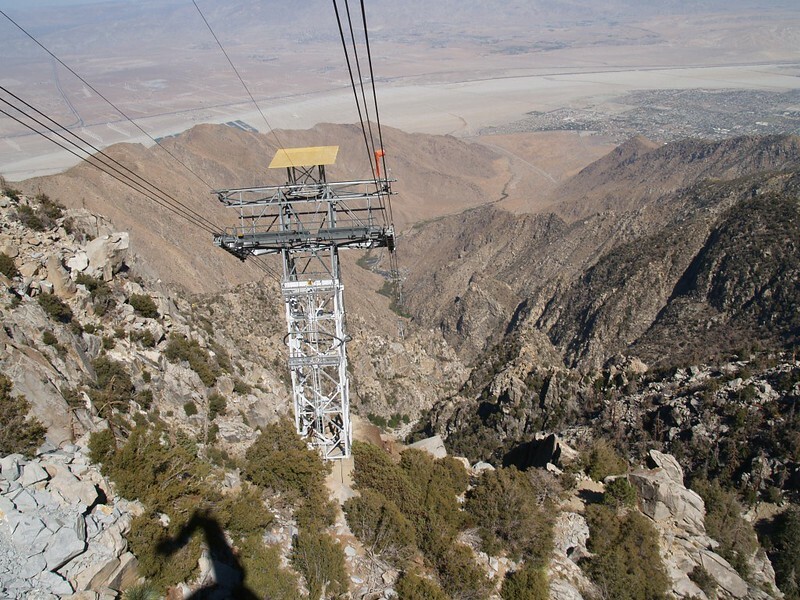 The ride itself is exhilarating, and there is even a restaurant up there. But we didn’t stop for any of that. We began hiking right away, heading uphill on the trail to Round Valley. It was great to be back in the mountains, with the smell of pine trees in the air. The trail was a bit of a workout, climbing 700 feet in two miles, but in the cool air of morning it felt easy. Just the same, we took a short break near the Round Valley ranger hut. We checked out the flow of water from the spring, Then we headed for Tamarack Valley and hoped to claim a really good spot, far away from almost everyone else. We intended to enjoy the wilderness in peace. 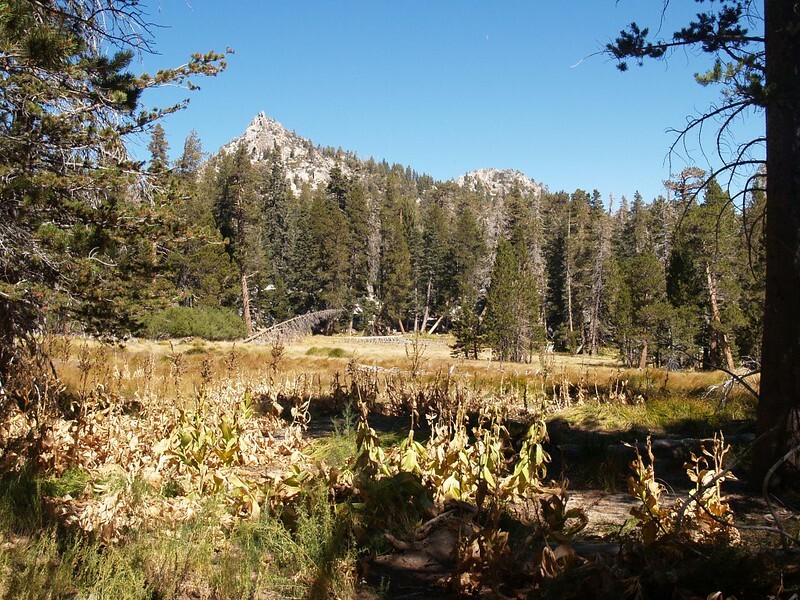 We hiked an additional 3/4 mile to the campground area and began looking for a good site. We hiked uphill as far as we could until we found a spot that was pleasant and had a good flat place to set up the tent. It was quite breezy that day, and every once in a while a big gust would spin down through the trees and stir up the sand and pine needles on the ground. 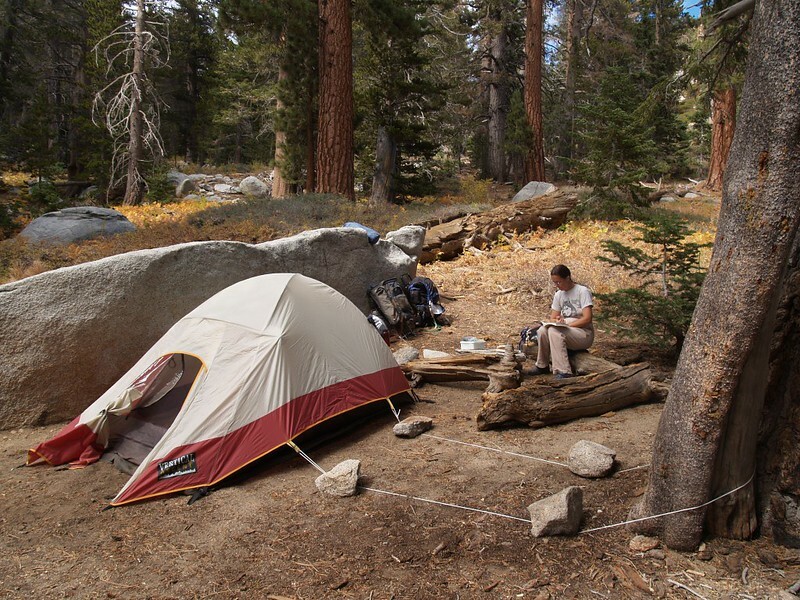 We chose the most protected spot we could find, next to a long granite boulder, and staked the tent down solidly. I set up the inside of the tent and Vicki readied the kitchen area. There were no campfires allowed, especially not on a windy day in October, so we’d have to sit on big logs while looking at the stove instead. Since we were going to stay here for two nights, we set everything up nicely. We took a short nap after lunch, and afterward spent the afternoon hanging around the campsite reading our books. It was a pleasant time. 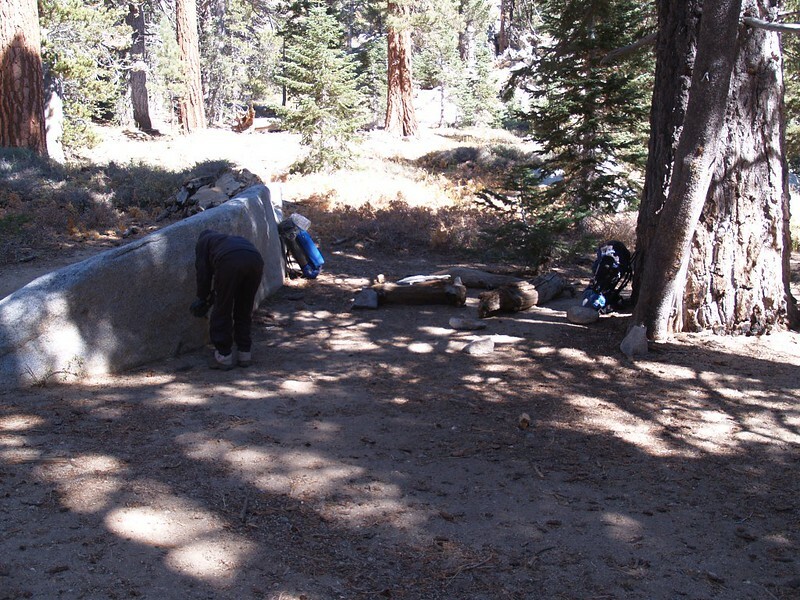 We wandered around the immediate area and tidied up the campsite a bit. There was one final camping spot a bit higher up the trail than ours, which we checked out just for fun, but we still liked this one better. We also discovered that the days get significantly shorter in October, and the afternoon flew by. We emptied out my big pack and put our water filter and empty containers inside. It was time for our afternoon hike. We headed back to Round Valley and the spring. Cool clear water was flowing out of the pipe, as usual. I never bothered to filter this water, since it was directly out of the ground, but Vicki insisted. So she did the pumping while I took photos of the meadow. 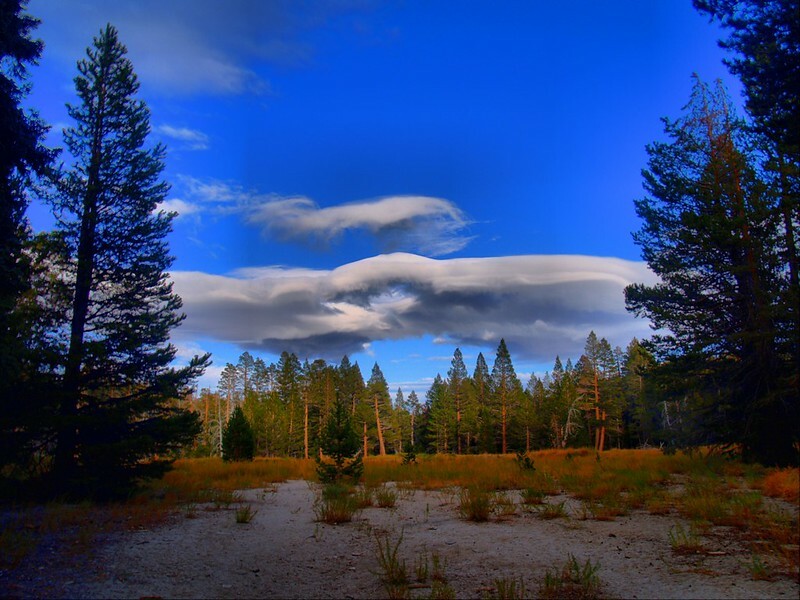 The grasses and plants were mostly brown and dry for Autumn, but the sky was awfully blue, and the clouds were pretty too. We also signed in at the small Ranger building and claimed the “Andesite” campsite on the official sign-in board. The weather turned cooler as the sun descended, and we headed back to camp. We now had enough water for dinner, breakfast, and tomorrow’s day-hike to the summit. We ate dinner fairly quickly as it was getting cold. Then we headed into the tent. It wasn’t windy at all in there. We read our books as the evening turned to night, listening to the gusty winds as they moaned and whirled high above us in the trees. It felt good to be snug inside our little home away from home. 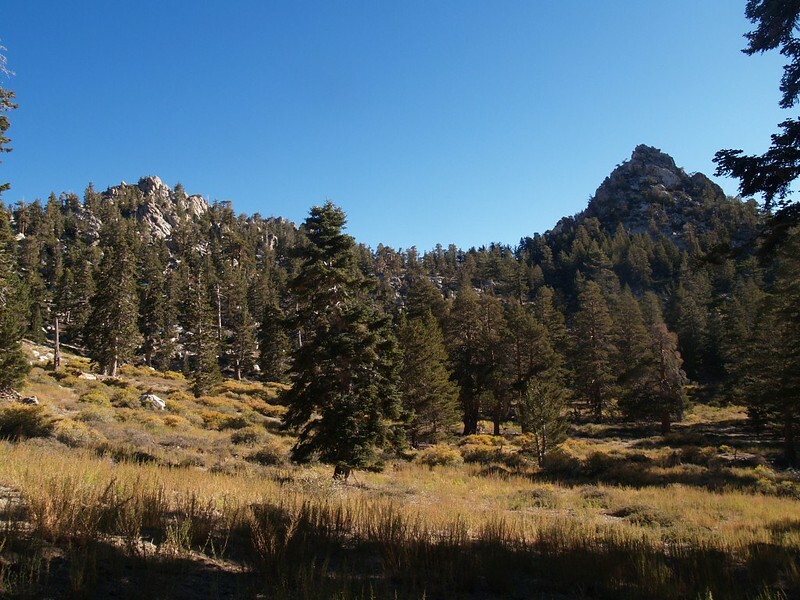 Our plan for the day was to hike the old, unmaintained Tamarack Trail to its intersection with the main San Jacinto Peak Trail just below Jean Peak’s saddle. 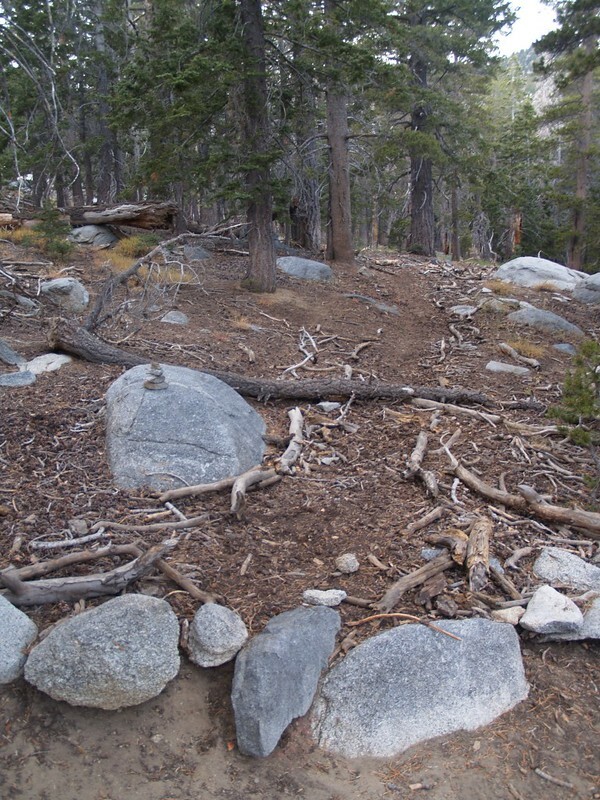 I was delighted when I discovered that the map on my new GPS showed the location of this mysterious, legendary trail, which had been “erased” from more recent topographic maps available online. We didn’t like people censoring our information, pretending that this trail didn’t exist. We’d searched for it before, from high up on the mountain, but we had no clue as to its actual path. This time we intended to do it right. We took our time getting up and eating breakfast, and waited for the sun to warm the air. Then we got moving. We went back to the main trail into Tamarack Valley and found the spot where they’d obscured the start of the old trail with a few dead logs and branches. After that, they’d done nothing whatsoever, and the trail was quite obvious. In fact, it tracked exactly with the line on my GPS. So we became more confident of success the further we proceeded. As we hiked, it became clear that this trail had been built correctly, with proper drainage and plenty of stone supports to keep it stable. We continued uphill into the scrubby sections, and the signs of neglect became apparent. The chinquapin plants were beginning to encroach on the trail. But they don’t have thorns and it was easy enough to push on through. Using the GPS, we did our best to follow the track of the old trail, but eventually it made a wide loop that seemed senseless to follow, as it didn’t lead uphill or do anything useful that we could discover. This was in a forested, boulder-filled section that was quite flat. So we cut off that loop and intersected the track a bit higher. Really, we wanted to discover precisely where it intersected the main trail, so we could descend this way someday if we felt like it. And that’s exactly what we did. Once again, they’d blocked it off with some old logs and branches right at the end and that was about it. That’s all it takes to kill off a perfectly good trail: Stop people from finding it and don’t bother spending any time or energy cutting back the overgrown plants. Sad but true. After that, we were back on old, familiar ground. 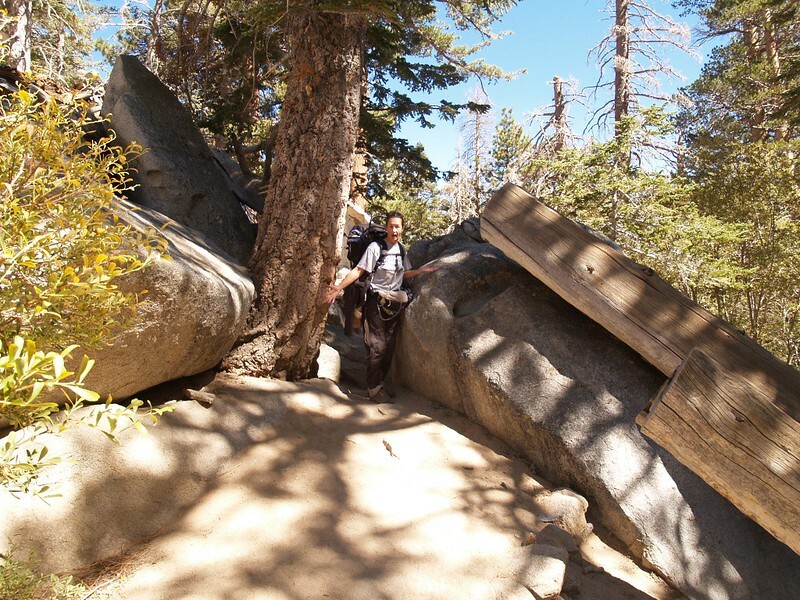 We continued climbing on the main trail until we reached the switchback turn near Miller Peak. 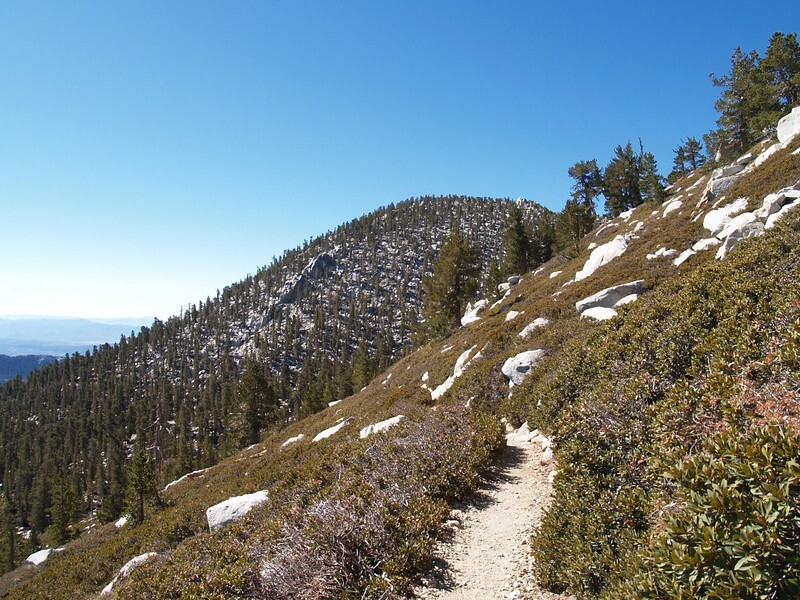 Now that we felt confident in our cross-country skills (thanks to the help of the GPS) we decided to check out Miller Saddle and climb the north ridge directly to the summit of San Jacinto Peak. On the saddle we discovered a truly excellent camping spot that had obviously been used many times in the past. This site was definitely not on the ranger’s “approved list” of places to camp. But it sure had a great view! After that we headed for the summit. We weren’t sure what to expect, but the north ridge was easy to climb, and there was even a faint “use” trail that appeared and disappeared as we hiked. It was pretty hard to get lost here, and I never even bothered with the GPS. It was all about the “Rule of Up” which you really can’t get wrong. 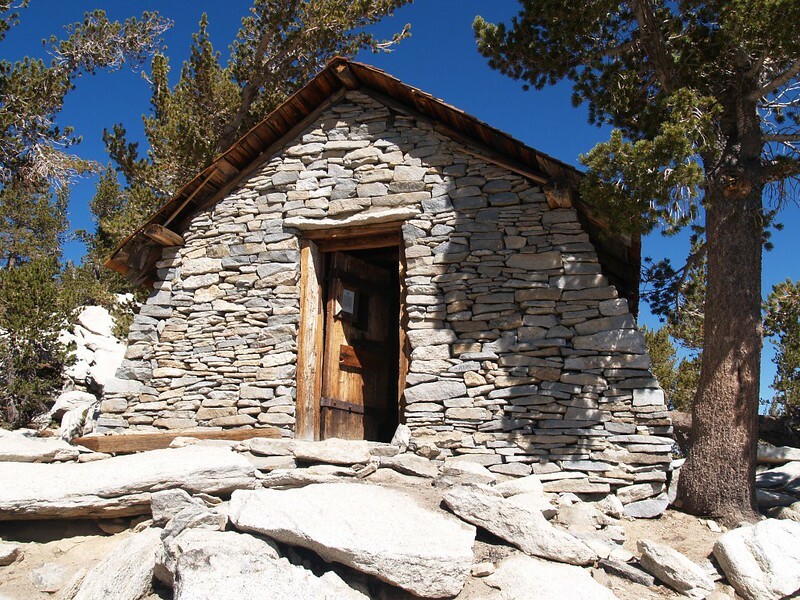 Along the way, we came upon the San Jacinto Summit hut, a stone building that was built by the CCC long ago in the nineteen thirties. There are bunks and some emergency gear inside. I know at least one person who had to stay here during a winter storm, and this building surely saved her life. 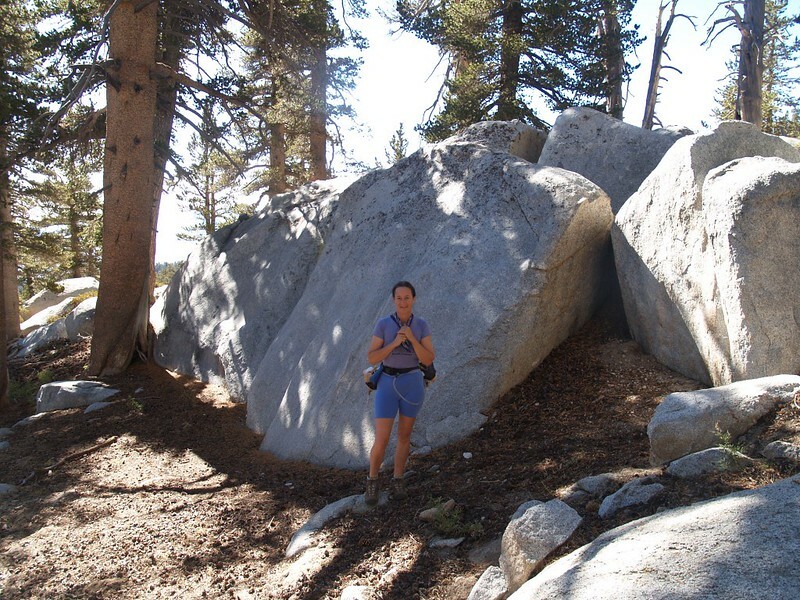 After that, it was a fun scramble up large granite boulders to the 10834 foot summit of San Jacinto Peak. We did it! But we knew we would. We’d been here before. We took the requisite photos, then climbed down a ways and hid from the breeze in a small nook that previous hikers had made. We ate lunch and watched the other folks arrive who’d hiked all the way up from the tram. We managed to beat the rush by starting out before the first tram had even arrived. We didn’t stay up there for long. 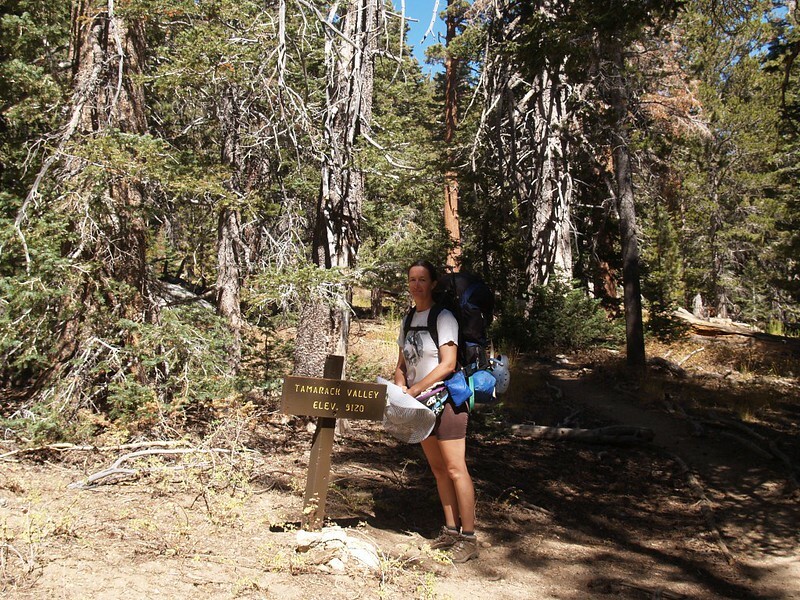 We headed back down via the normal route, and followed the main trail all the way to Wellman Divide. 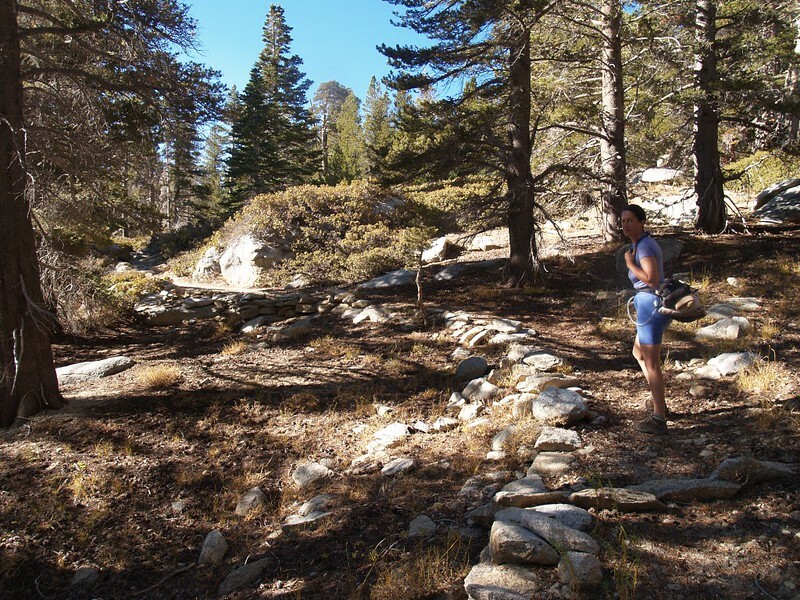 We’d had enough of unmaintained trails and cross-country route-finding. 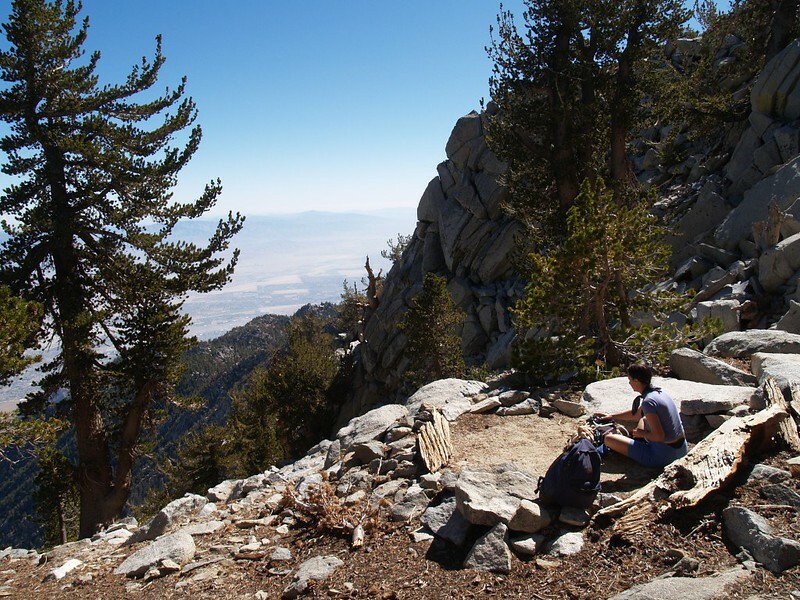 We stopped for a break and took in the excellent view south over the Tahquitz Valley from the divide. This was a very popular place for a rest, and there were plenty of people simply hanging out, taking photos, and enjoying the sunshine. Hiking in from the tram, this spot was a great consolation prize if you weren’t feeling strong enough to make it all the way to the summit. We continued downhill to Round Valley, about a mile of easy hiking. We filtered a bit more water as long as we were there. 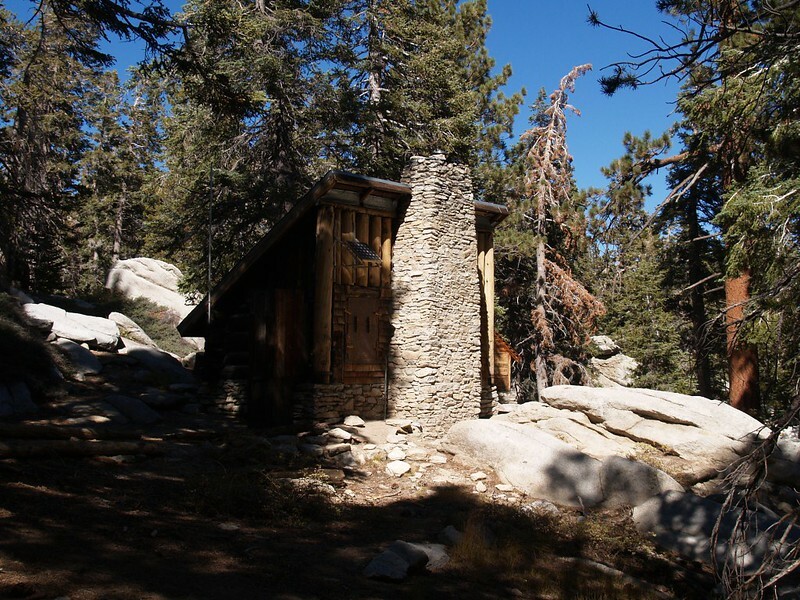 We checked out the Ranger hut, but it was long past Summer and no rangers were present. There were a decent number of people signed in on the board, but there were also plenty of vacancies. Then we headed back to camp. It was only 3pm when we arrived, so we wandered around the area. We discovered an old mortar-topped stone wall that formed a corner in the hillside. 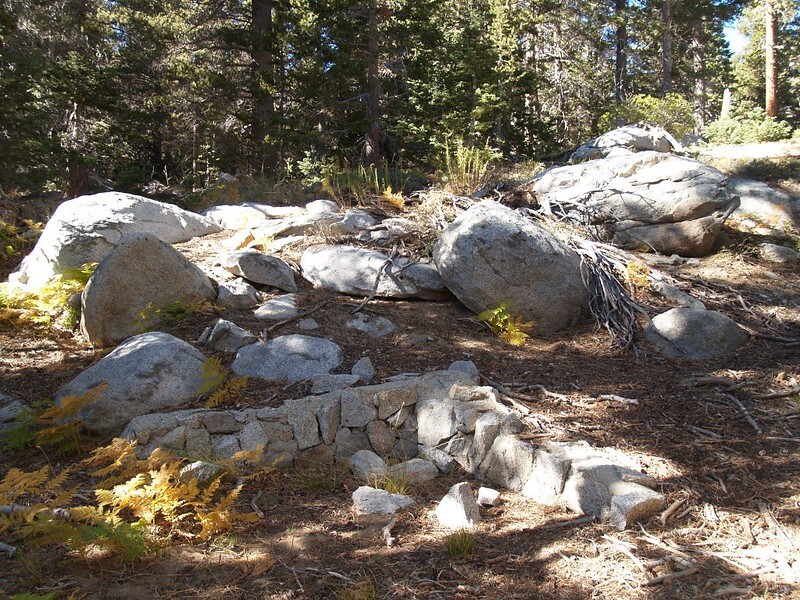 This must have been made by the CCC long ago when they were building the local trails and the summit hut. We wondered if there were archeological treasures to be found nearby, but of course we didn’t try digging up anything. We’d leave that to future generations. After that, there wasn’t much left to do except take a nap in the tent and/or read our books. As it began to get darker we realized that we’d better eat some dinner, so we ventured back outside while wearing our warmest clothing. It was getting downright cold out there! Yes, we admit it: We were wusses from sea-level San Diego, and it doesn’t take much for us to begin shivering and freezing. After eating, we headed back inside the tent and got into the sleeping bag where it was cozy and warm. We decided to enjoy this final night of the 2009 camping season by sleeping in as long as possible the next morning. We were serious slackers that morning. True, I woke up at first light, but all I did was stick my head out the door of the tent to see if there was potential for sunrise photography. There were no clouds whatsoever, so I zipped the door shut and went back to sleep. It was cold out there! It definitely wasn’t a mild August morning. So we patiently waited until the sun rose high enough to look down through the trees upon our tent. And then we waited some more while it warmed the air inside. We eventually got dressed for the day and made our way outside. We cooked up some breakfast and hot chocolate. We knew full well that we didn’t have much of anything to do except hike some easy miles downhill to the tram, so we went back inside and read our books for an hour or so. It was a very peaceful morning. But even lazy back-slackers [sic] have to rejoin the civilized world eventually. 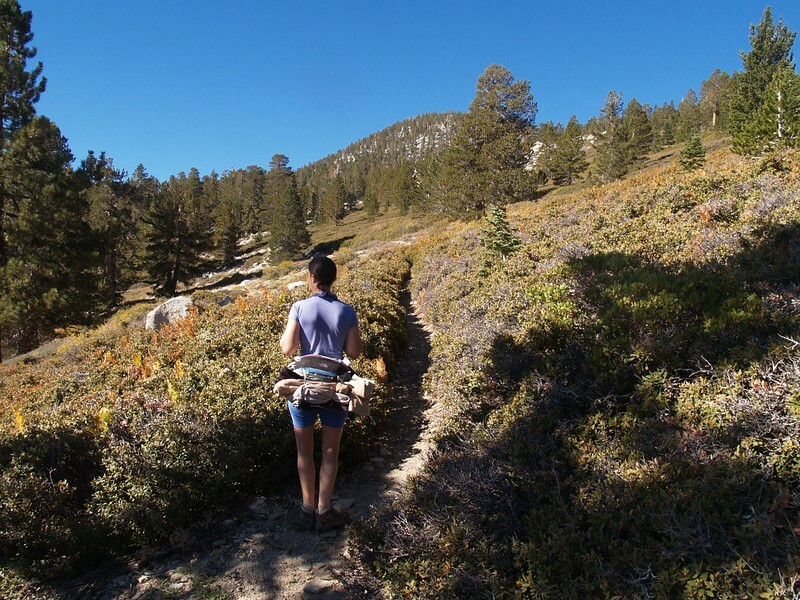 We packed up our gear and began hiking. We headed out the same way we came in, via Round Valley. We’d had a fun weekend and we were quite happy, and it was enjoyable greeting all the day-hikers coming up from the tram. Some of them were amazed that we’d camped up here for two entire nights, daring wild animals and other equally unlikely dangers. We laughed and laughed. People were silly, all right. 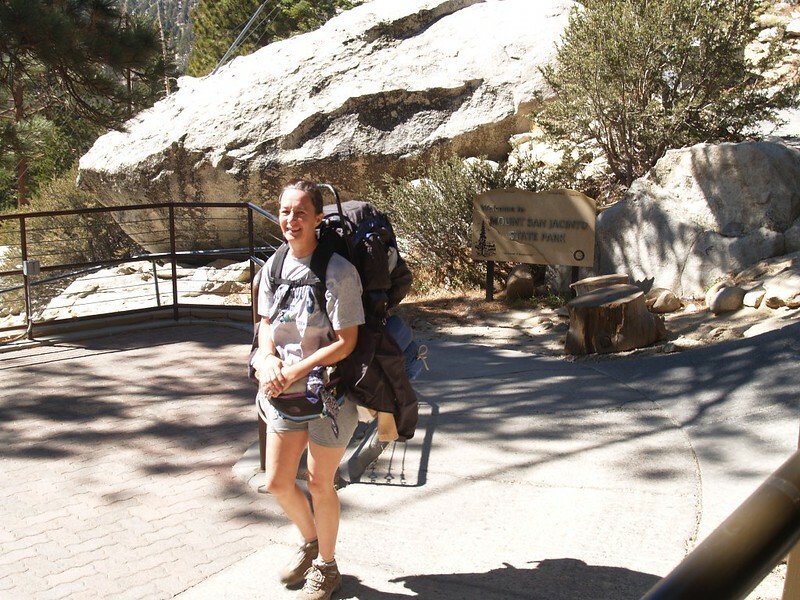 All too soon, we arrived back at the Long Valley Ranger Station, and climbed the cement switchbacks up to the tramway. Those uphill switchbacks were the only exercise we got that day. 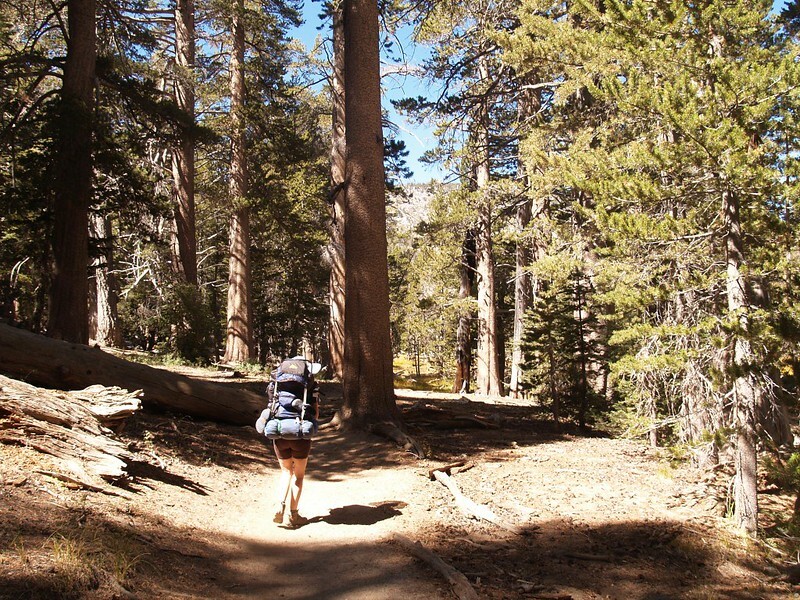 We stopped at the top and took a final look back at the forest, inhaling one last breath of clean pine air. Aaahhh! We entered the building and boarded the next tram car. The ride down was enjoyable, as always, and soon the air was warm and smelled like the desert, of chaparral. We hiked to the car and loaded up our gear. Then we looked back up and said good-bye to the mountain. As we drove home I began planning some desert trips, since it would soon be far too cold to backpack in the mountains. 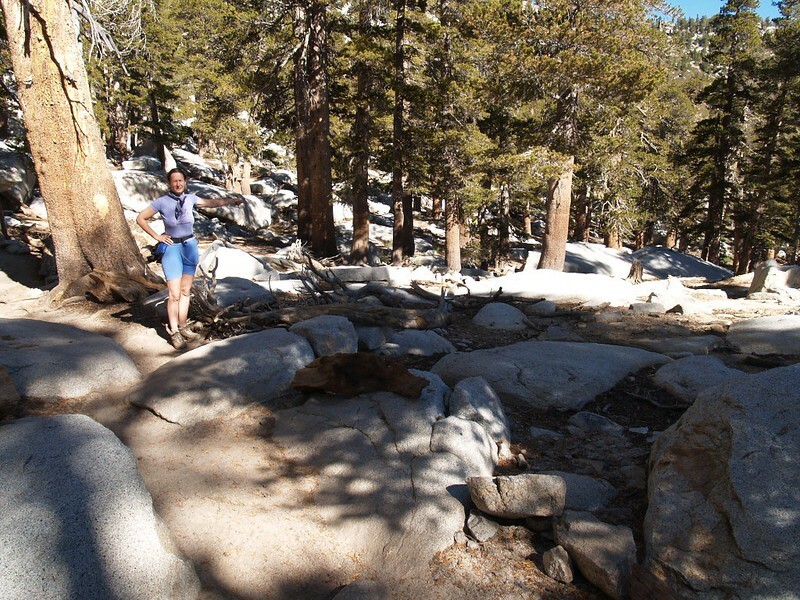 And maybe I’d begin researching about a High Sierra adventure for next Summer, as well. View out the tram car window as we head down to the Lower Tram Station. Good-bye, San Jacinto! See you next year!